5 minute healthy dinner from last night! Vegan Chili using only 6 ingredients. So you got an Instant Pot for Christmas?! Great! I’m betting some of you still have them in the box because you’re nervous. I’ve been cooking with a pressure cooker for years and haven’t had it explode on me...yet?! Luckily, the Instant Pot makes pressure cooking a lot easier! When a recipe says “cook on high pressure for 10 minutes” that’s the time you set using the Manual setting. It’s takes 10+ minutes to come up to pressure and then the timer will start counting down. Total cooking time is 10+ minutes + Manual time. Use manual release by switching to venting with foods that you don’t want to overcook like vegetables or if you’re in a hurry. Use natural release by letting the pressure release on it’s own if it needs a little more time to cook or foods that don’t have an exact cook time. I rarely use this setting unless it’s brown rice, but even still, I have used both methods with rice and it’s been fine. You’ll know the pressure is released and you can take the lid off when the red button next to the venting knob drops down. Use the ‘Sauté’ function to brown onions, veggies, spices, and meat before using the manual pressure setting. This extra step gives your food more flavor. This is not a necessary step, but a nice touch nonetheless. Remember to unplug your Instant Pot unless you want it to keep warm because it will keep the food pretty hot and make the rice on the bottom crispy. Yes, I know this to be true. Brown Rice: Rinse rice. Use a little more than a cup of water per cup of rice (between 1 - 1 1/4 cup). Set to Manual for 15 minutes. Allow to release pressure naturally. Quinoa: One cup of liquid (water, broth, or stock) to one cup rinsed quinoa. Set to Manual for 1 minute. Always clean the silver insert (the part the food goes into). I always wipe down the inside of the top. It’s not recommended to take the sealing ring out every time because you will stretch it and wear it out. Instead, take the sealing ring out and clean it every once in a while. Use your discretion on that one. 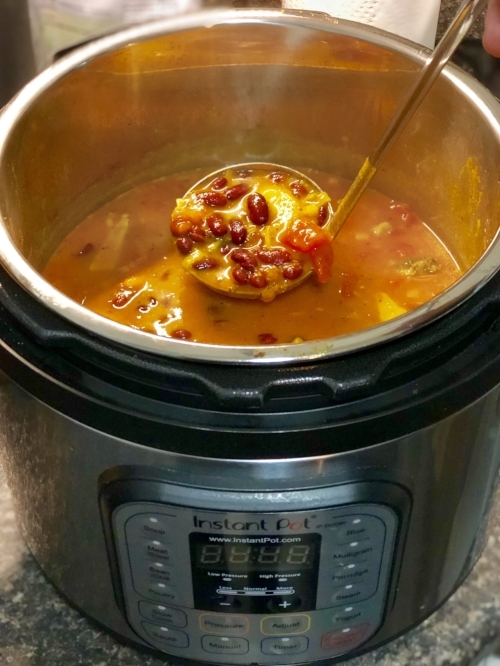 The Instant Pot is a much faster way to cook our dinner! Can I get an, Amen?! We no longer need to wait 8 hours for the slow cooker. We can have a healthy dinner ready in a half hour- even faster than that go-to macaroni and cheese and chicken tenders. I’ve also “baked” the best banana bread ever in my Instant Pot, but I’ll save that for the next edition. The possibilities are endless! Giving you bite-sized inspiration, questions to ask, and information to help you make healthier choices from the inside out. Got it! I look forward to serving you on your journey to a healthier you! © 2018 Jessi Culyer, LLC. All rights reserved.